Payments for Open Item accounts are posted in Direct Bill > Customer Processing > Enter Open Item Payments. Note: For Balance Forward Payments, see Manual Postings . The customer balance displays at the top left. The unpaid, overpaid, or partially paid invoices are on the right. When the screen opens your cursor will be at "Customer code". Enter the customer code or select from the look-up. Enter the payment date at the prompt. Enter a valid transaction code for the payment. If this is a credit card payment processed through Element PS or Shift4 you can type "/" and press to bring up the credit card prompt. Enter a reference number unless this is a credit card payment processed through Element PS or Shift4. If this is a credit card payment, leave this field blank. Enter the payment amount. Unless you are applying a credit (refund or offset) you do not need to type the minus sign. If this is a normal payment, just enter the amount. The system will add the minus sign, thus deducting the amount from the balance due. 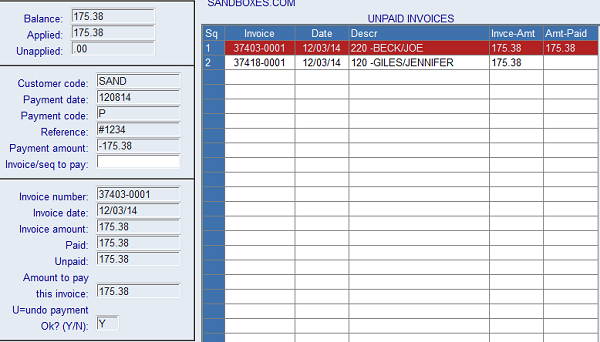 For invoice to pay you can type the invoice number or the sequence number. You also can click the invoice to pay. 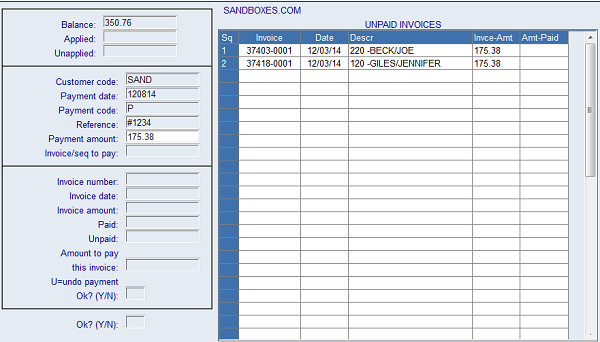 If paying multiple invoices (excluding credit invoices) click all of the invoices to which this payment will apply. When you click the invoice to pay it will turn blue. See below. 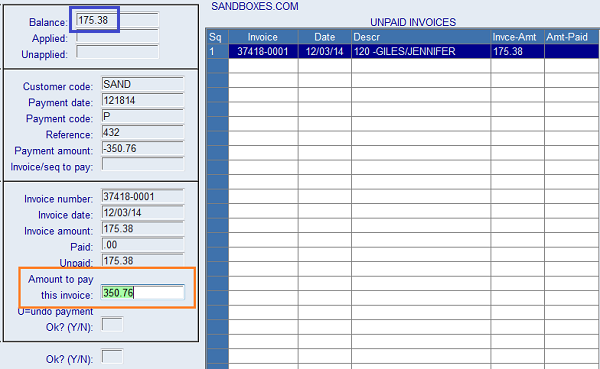 After selecting the invoice(s) click the "Invoice/seq to pay" field. 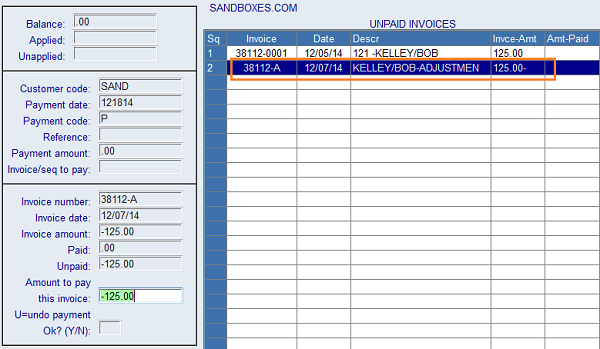 The cursor will move to the "Amount to pay this invoice" field as shown above. If you are paying the full amount, press Enter. If this is a partial payment, enter the amount and press Enter. The invoice will turn red and your cursor will move to the first "Ok?" prompt as shown below. After pressing Enter at the first "OK?" prompt your cursor will return to the "Invoice/seq to pay" field. Make sure the "Unapplied" amount is .00 (zero). If there are no more invoices to pay with this payment and the unapplied amount is zero, press Enter. The cursor will move to the second "Ok?" field as shown below. If everything is OK, press Enter again and your cursor will return to the top. 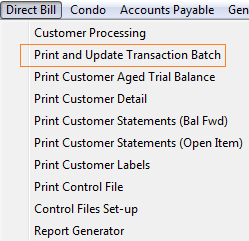 When you center the customer code and press Enter after doing the above steps, the invoice will not show up as unpaid. 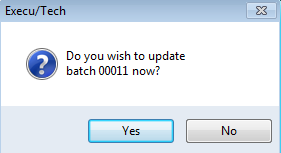 Remember to print and update your transaction batch! As show below, the transaction batch shows the payment along with a list of all invoices paid by that transaction. Keep this report. At times you will have credit invoices. In the example below, a DB payment was posted to a folio and then a credit was posted to it, giving the account a sum of zero between the two invoices. 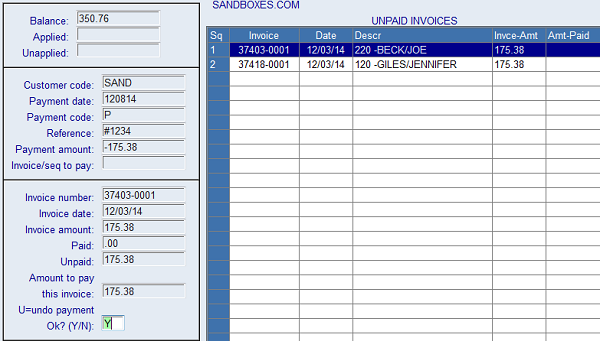 The two invoices will show up as unpaid even though they cancel each other out in the sum of invoices. To make these invoices show as paid, you will post a zero payment and apply it to both invoices. The credit invoice MUST be applied first. 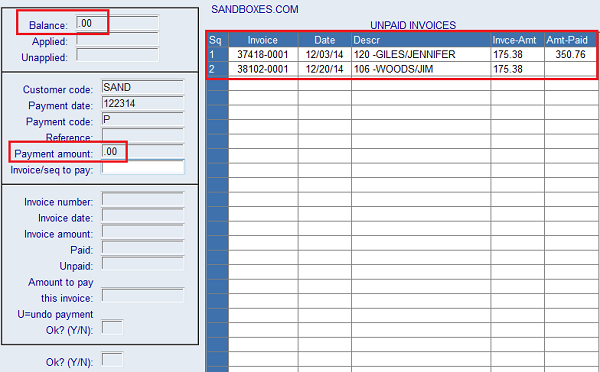 In the example below, an invoice and a credit invoice both are unpaid although the customer balance is zero. Enter the payment date, payment code, and reference as usual. For the payment amount enter .00 (zero) or just press Enter. Your cursor will move to "invoice to pay". Click the credit invoice first. You must apply the credit invoice first. After clicking the invoice, click in the "invoice/seq to pay" field and continue as usual. The invoice will turn red. As you see below, at this time the applied amount is -125.00 and the unapplied amount is 125.00. Click the debit invoice and continue. Continue to Press Enter until your cursor is at the second "Ok?" prompt. If the unapplied amount is zero, press Enter to accept the transaction. When you have finished, the invoices will no longer show up as unpaid. Below is the customer detail display for the above transaction. First is the original invoice. Second is the credit invoice. Third is the zero payment applied to the two invoices. In the example below you will see that the balance on the Customer Detail screen does not match the Balance on the Enter Open Item Payments screen. This is something that can happen, for example, if you have network problems and there is a brief interruption in the data communication. In this instance, a payment applied to the invoice but did not post to the customer's account. In the image above, the payment of $431.10 was applied to Invoice 01134-0001 and the invoice no longer shows up as unpaid. The balance is correct. In the image below, the payment of $431.10 did not post although the invoice shows as paid. The balance is off by the amount of the payment. To fix this, do not go to Enter Open Item Payments. Go instead to "Enter Transactions". Enter the customer code and press Enter and then enter P in the "Type" column and press Enter. As show below, a popup will tell you "No bal forward payment for an open item acc". To override this, type F and press Enter. NOTE: Only do this when correcting an out-of-balance account as described herein. Otherwise post all open item payments in the Enter Open Item Payment screen. Enter the transaction date, valid transaction code, amount, reference and comment, pressing Enter after each entry. When you cursor is in the OK column, press Enter again to move your cursor to the next line. If you do not press Enter in the OK column, you will not save the transaction. Below is the customer detail display, showing the "forced" payment. Note: If you are using Execu/Tech's Back Office General Ledger, you will need to see if the original payment transaction posted to General Ledger. If it did, you can delete this transaction from the G/L batch (not the direct bill batch). Remember to update your direct bill transaction batch when you're finished. If you wish, you can wait until the end of the day if you have additional transactions to post. See also Fix Out of Balance Direct Bill Accounts . If a customer overpays, you must apply the full payment amount, even if it is greater than the sum of invoices. In the following example, the balance is $175.38 - the same as open items (unpaid invoices). However, a payment of $350.76 was received. Enter a valid transaction code as usual. Select the invoice to pay. IMPORTANT: When you get to "Amount to pay this invoice" enter the full payment amount, not the amount of the invoice. You must apply the entire payment or you will not be able to save the transaction. Later, when there is another invoice to apply the payment to, you can post a zero payment and reapply the payment, distributing it between the two invoices as shown in the steps below. This way, the two invoices won't continue showing up as unpaid. The payment amount will be zero. Note that part of the payment has been applied and part has not been applied. You need to select the second invoice now, and apply the payment to it. In the customer detail display, the first line shows the first invoice. The second line shows the overpayment. The third line shows the second invoice. The fourth line shows the zero payment with the zero payment applied to the two invoices, "undoing" the overpayment of the first invoice.